Siemens has achieved a technological breakthrough by finishing its first full-load engine tests for gas turbine blades completely produced using Additive Manufacturing (AM) technology. The turbine blades, built using 3-D printing technology, were tested at 13,000 revolutions per minute and temperatures beyond 1,250ºC. Siemens manufactured the blades at UK-based Materials Solutions, which it acquired a majority stake in during 2016. 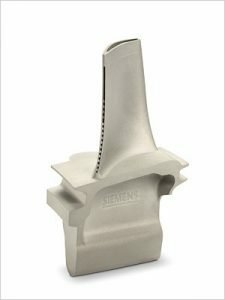 “This is a breakthrough success for the use of Additive Manufacturing in the power generation field, which is one of the most challenging applications for this technology,” said Willi Meixner, ceo of the Siemens Power and Gas division. The blades were installed in a Siemens SGT-400 industrial gas turbine with a capacity of 13 MW. The AM turbine blades are made out of a powder of high performing polycrystalline nickel superalloy, allowing them to endure high pressure, hot temperatures and the rotational forces of the turbine’s high speed operation. At full load each of these turbine blades is travelling at over 1,600 km/h. This type of 3-D printing technology could, in the future, force a significant change in logistics supply chains. The technology also allows for prototype equipment to be conceived and developed extremely quickly, in comparison to traditional methods. “This exciting technology is changing the way we manufacture by reducing the lead time for prototype development up to 90 percent,” said Meixner.